The ability to see is something we often take for granted. 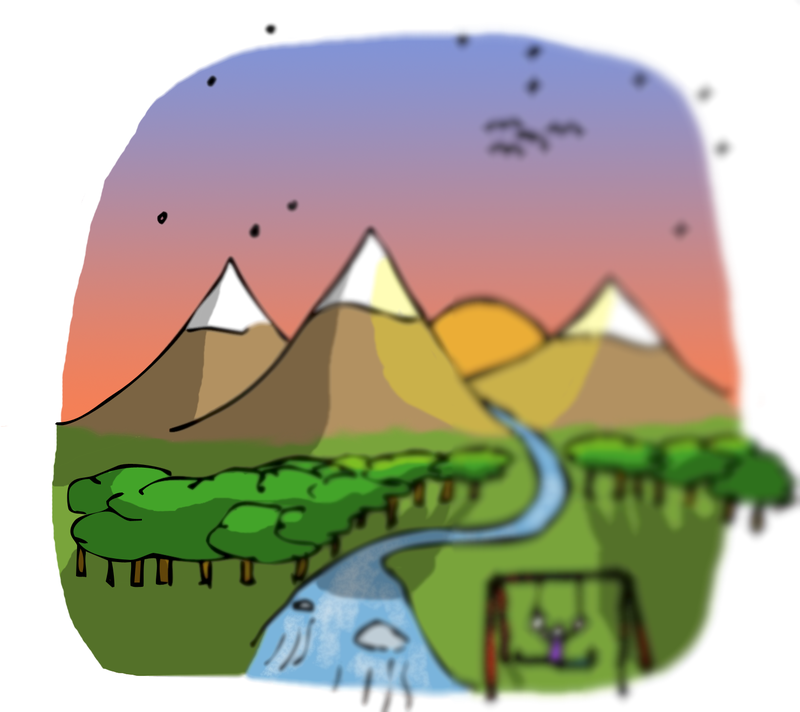 Every day, those of us with sight experience a range of shapes, sizes, colours, and movements that we only really appreciate when we are asked to – when watching Olympic gymnasts or when we’re confronted by something atypical, like a sunset or a mountain range. Most of us only really begin to appreciate the little things our eyes take in when they can no longer do so in a seamless way. For the average person, this happens as we age and our eyes naturally lose their ability to focus. For the not-so-average person, it can happen very suddenly. 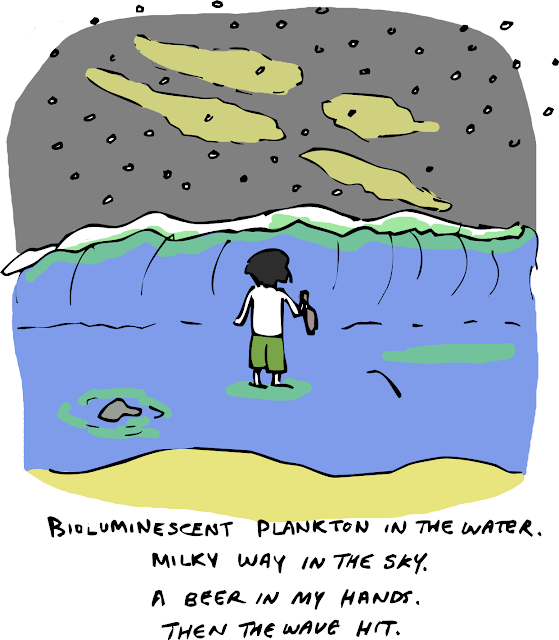 Such an ‘unaverage’ (not a real word) experience befell our illustrator, here at Sketchy Science, just last week. While on a trip to a conference on the southeast coast of the United States, after a night of partaking in the local libations, our sketchist (also not a real word) found himself standing in the Atlantic ocean, when a rogue wave of epic (likely very small) proportions tossed him asunder, claiming his glasses to the surf. I don’t actually know if this is how it happened, but it is how I prefer to imagine it. It is much funnier than him simply dropping his glasses in the water. 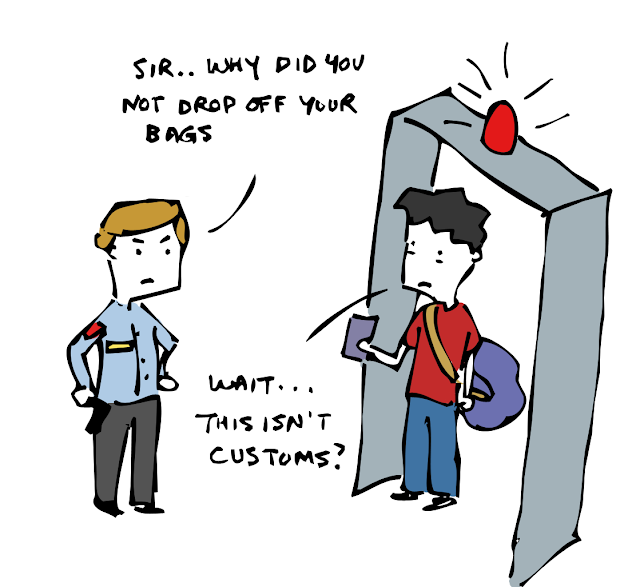 Regardless of how it happened, the result was a fumbling Mr. Magoo-esque adventure through the airport, onto a plane, and back home to Canada. It’s amazing how two pieces of glass (or plastic) can play such a major role in a person’s life. 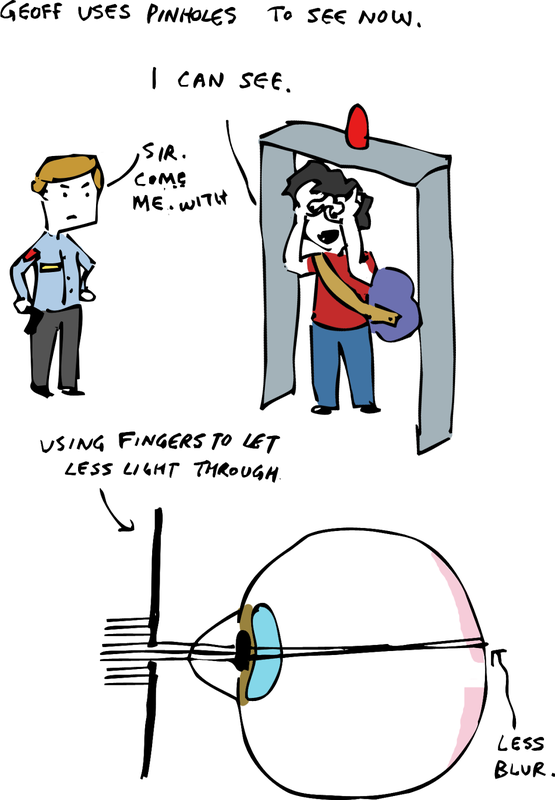 But how do glasses work and why do some of us need them? The answer lies in the three most common problems with respect to how our eyeballs function. 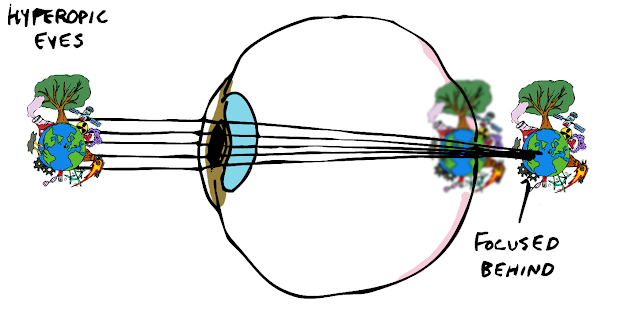 The four parts of your eye that impact your ability to see are, from front to back - the cornea, which is the clear window on the front of your eye that lets light in; the pupil (the black part), which widens or narrows to let in more or less light; the lens, which bends and focuses the light; and the retina, which is the back wall of your eyeball onto which images are focused before sending impulses down the optic nerve into your brain for processing. 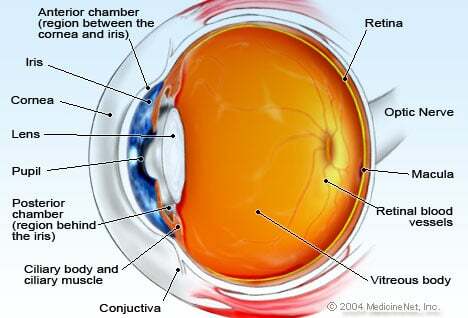 Most problems occur at the beginning of this whole operation, with the cornea. 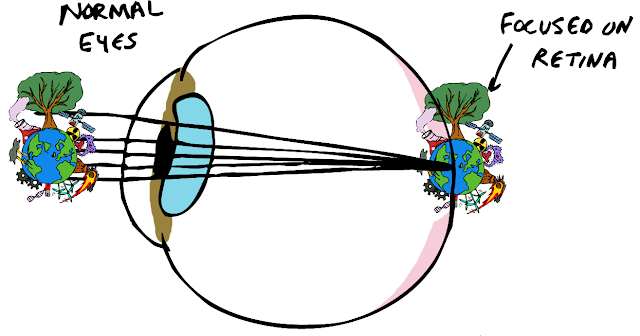 The tricky thing about eyeballs is that they are spheres, meaning that as light moves through their rounded surfaces, it bends. 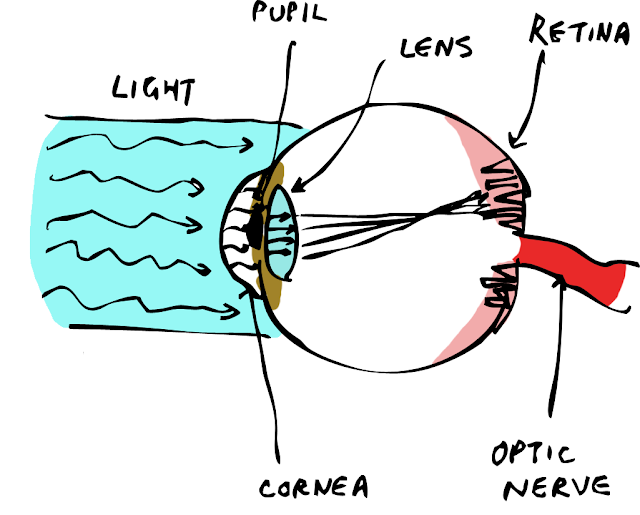 If your eye is not shaped just right, the light coming in can focus at a point that isn’t exactly on your retina. 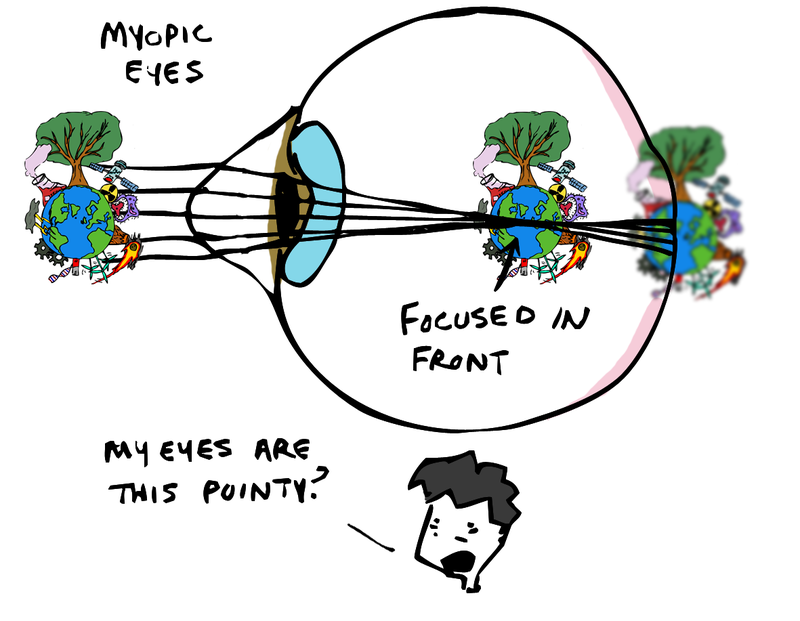 If your cornea is exceptionally curvy, the light will bend too much and focus in front of the retina, leading to nearsightedness and trouble seeing distance objects; this is called Myopia. 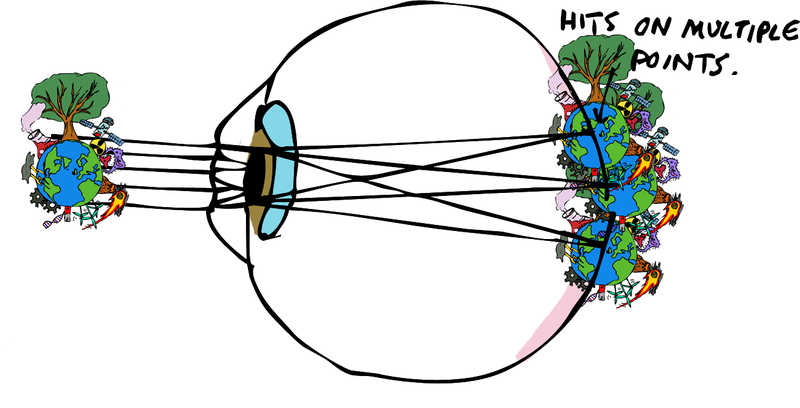 If your cornea isn’t curvy enough, you have the opposite problem with light focusing behind the retina leading to farsightedness and trouble reading the newspaper; this is called Hyperopia. If your cornea has a bump, ripple, or scratch on it, the light gets distorted in other ways, and this is called Astigmatism. Glasses – or “corrective lenses”, if we want to be more accurate and inclusive of people with contact lenses – can correct these problems by bending the light in a way that compensates for misshapen corneas. The physics of light dictates that as light moves through a medium, such as glass, it bends or “refracts” towards the thickest part of that medium. Lenses are described as either “plus” or “minus” lenses depending on whether they are thicker in the middle or towards the edges. 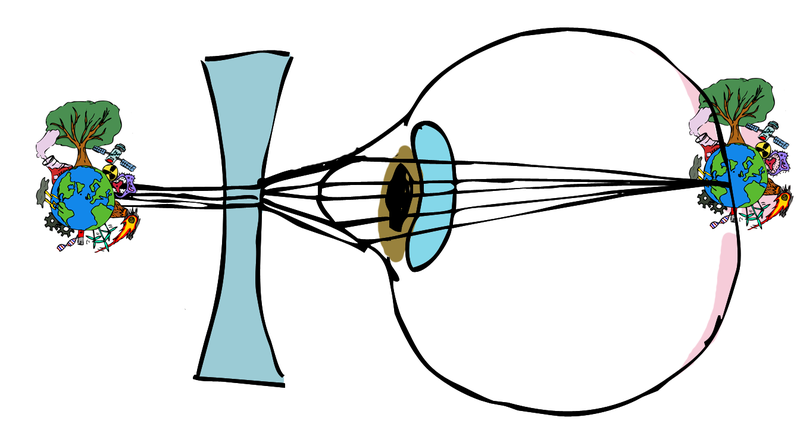 Plus lenses are thick in the middle and so bend light inwards, leading to a focal point behind the lens itself. Pushing the focal point backward corrects for Myopia. Minus lenses refract light towards their edges, leading to a focal point that is actually in front of the lens itself. Moving the focus forward corrects for Hyperopia. To make things even more fun, plus and minus lenses can be combined to correct for more complicated vision problems. That is really all there is to it. This impressive but simple technology has allowed people to see more clearly since the first pair of spectacles adorned some nobleman’s nose between 1268 and 1289 in Italy, after being invented by someone whose name has been lost to history. So, the person who thought up the way we still correct vision today will forever go as unappreciated as the clear vision he sought to bestow upon the masses, to only be admired when a rogue wave leaves one of us blinded.